"You have the test subject, Wilson?" You hear your name and look around. There doesn't seem to be much different from the last time you looked around, so you stick out your tongue. There doesn't seem to be much different now, either, except that your tongue is sticking out, so you pull it back in. "Its name is not Edwin. Its name is Biological Intelligence Experiment Subject #42, Lot 6, Reptile Engineering." "I pity your children. What did you name your daughter? ‘Miosis’?" "Funny, Wilson, funny. Just put the test subject in the maze, eh?" Whoa, you think, something's happening. You look around in time to realize that you're not sitting on anything anymore. You're rising in the air, and you think it might be wise to stick your tongue out. "Wilson! Put it down! Let's get on with it." Now you're going down, and you think it might be wise to pull your tongue back. You are resting on the ground again, but a different ground than you were restin on before. You vaguely think how nice it would be to have hands so you could scratch your head. Or even eyelids to blink quizzically. Instead, you stick your tongue out again. "This is supposed to be the best the guys in BioEng can come up with? It looks pretty stupid to me." "Yeah, well, you look pretty stupid to me, so who's to judge?" "Your professional standards are amazing, Wilson. I am in awe." "Yeah, yeah. Just fill out the form on the clipboard. I'll start the experiment." Suddenly, something is very different. Very, very different. Very, very, very different. You decide to stick out your tongue. Something's still very, very, very different. You pull your tongue back. Something continues to be very, very, very different, and now you're sure it's not your tongue. Something red gleams down a passage. Why, it's food! you think joyously. Food!Foodfoodfoodfood! "Jeez, look at the way he took off. He must be hungry." "I still say it doesn't look very bright." To dearchive (unsqueeze) Experiment 42, copy the files EXPER42.ARC and ARC.TTP off this month's disk onto a newly formatted floppy or an empty folder on your hard disk. Double-click on ARC.TTP and type EXPER42 when the program requests input. To run the game, double-click on GFABASRO.PRG. When the file selector appears, select EXPER42.GFA. The only danger in Experiment 42 is dead ends. If you guide Edwin to a spot where his head cannot advance another space, Edwin will bite into his body and lose a life. 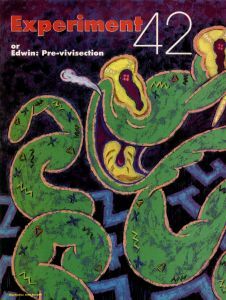 In Experiment 42, you control Edwin the Mutant Snake with a joystick plugged into the ST's joystick port. You navigate him through several laboratory mazes, eating prizes and avoiding dead ends. When you eat a prize—various fruits and other foods—Edwin's body will spend a short time digesting it, then he will grow by one body segment. The more prizes you eat, the longer Edwin grows, up to a set maximum for each level. 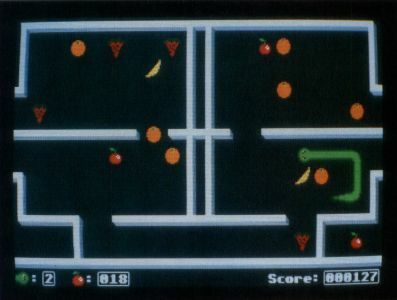 When you have eaten the number of prizes required to complete a level (shown on the bottom of the screen by an apple, followed by a number), the level will increase, as will the maximum possible snake length, the number of different prizes that can appear on the screen, and the snake speed. Each maze you complete will also cycle you to the next one until you have finished all five, at which point you will return to the first. If you try to run Edwin straight into a wall, he will automatically turn in an open direction, favoring the left side and top of the screen if he has a choice. To pause the game during play, press the space bar. 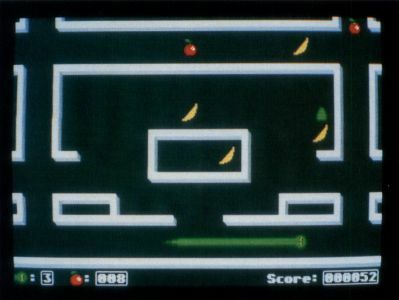 The space bar and the joystick button will move you from the title screen into the game, and from the end of the game back to the title screen. To quit a game in progress, press the escape key. Escape will also exit back to the desktop or GFA if you press it at the title page or the final score screen. Foodfoodfoodfood, you continue to think. Foodfoodfoodfoodsnake. "I told you he didn't look very smart." 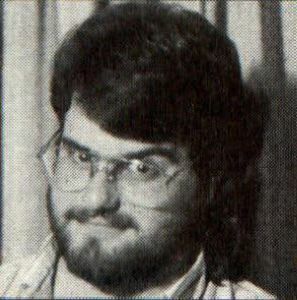 Greg Knauss is not 21, not attending the University of California, San Diego, and not telling the truth.